Pictured: WKCF Staff and Women of Purpose Executive Committee members receive proceeds from Beef Empire Days Chuckwagons in the Park Pancake Feed. On hand to present the donation were representatives from Commerce Bank in Garden City. 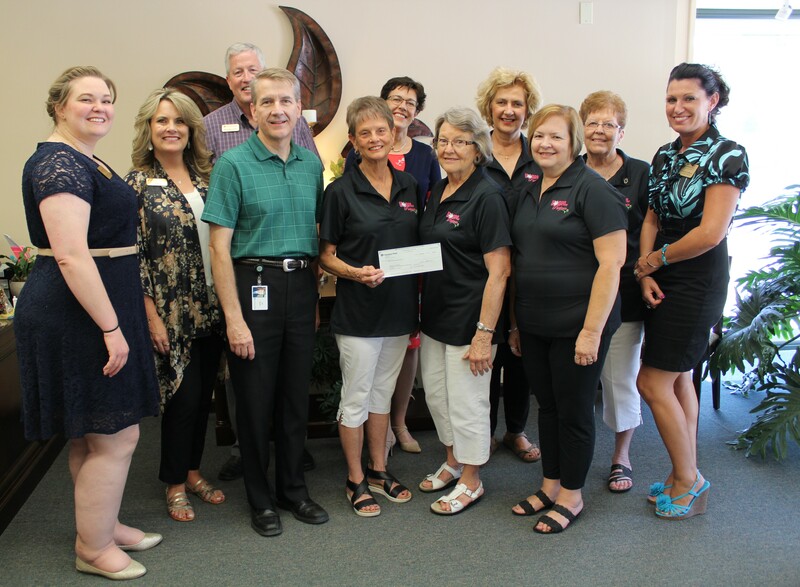 On June 11, representatives of the Women of Purpose Executive Committee received a $3,000 check from Commerce Bank’s President Richard Harp and Vice-president Kirk Olomon at the Western Kansas Community Foundation. Commerce Bank is donating all the net proceeds from the popular Chuckwagon Community Breakfast which was held during Beef Empire Days on June 9th this year. The Commerce Bank Chuckwagon Breakfast has a longstanding tradition. The breakfast is held in Stevens Park on the day of the Beef Empire Days-Parade. The all-you-can-eat breakfast offers pancakes and sausages at $3 per person. This year the Breakfast drew an exceptionally large crowd. According to Commerce Bank, about 900 people were served between 6:30-9:30 AM which is one of the highest turnouts in its 19 year-history. "Commerce Bank is proud to support the Western Kansas Community Foundation and Women of Purpose to help support and empower issues impacting women of our community," said Rich Harp, President of Commerce Bank in Garden City. "Women of Purpose has an incredible influence on Garden City, and we hope our contribution will help to continue their success." The Women of Purpose Fund was established within the Western Kansas Community Foundation in 2009. The fund was created by area women in support of local programs focused specifically on women’s causes. The fund has grown to over $150,000 and has supported 20 local agencies with grants totaling over $50,000. The $3,000-gift will be added to the Fund to support future programs.